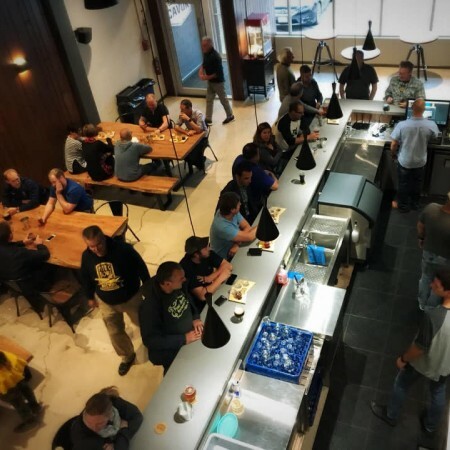 DIEPPE, NB – The Atlantic Canada Beer Blog reports that a brewery founded by two air traffic controllers has opened its taproom in Dieppe. CAVOK Brewing – which is named after the abbreviation for “Cloud and Visibility OK” – was launched last year by Serge Nadeau and Serge Basque as a small-batch home-based brewery, and entered the wider market early this year with Leger Corner Honey Ale, a light ale brewed under contract while work progressed on their full-scale facility. Located at 250 boul. Dieppe, the CAVOK taproom soft-opened this weekend with seven beers available including Rye IPA, Kettle Sour, Oatmeal Stout, West Coast IPA, Altbier, Saison, and the flagship Honey Ale. Beer sales are limited to glasses for on-site consumption at the moment, but growler fills will be available at a future date. CAVOK Brewing will be open Friday to Sunday during its soft launch. For more details, see the CAVOK Brewing Facebook page.